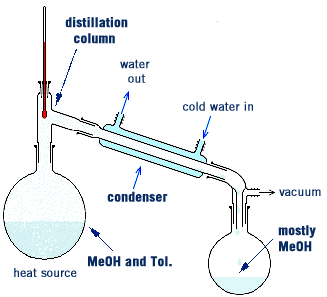 Distillation is a method of purifying liquids through differences in boiling points. For example, if the boiling point of liquid A is 65 ºC and the boiling point of liquid B is 111 ºC, than heating a mixture of A and B at 70 ºC (above the boiling point of A but below that of B) should boil off most of liquid A, allowing you to separate the two liquids. Before we go into distillation it’s a good idea to review what exactly it means for a liquid to boil. 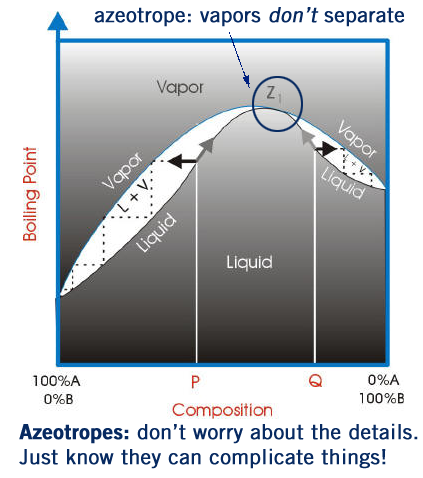 That is, how boiling point and vapor pressure are related. The force of these molecules escaping from the liquid and entering the air is called the vapor pressure of the liquid. Normally you don’t even notice it because the vapor pressure of most liquids is so much lower than the atmospheric pressure of the air. For example, at 20 ºC the vapor pressure (VP) of water is about 20 torr. 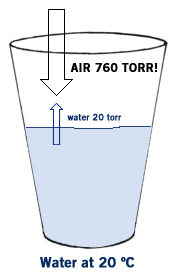 But the VP of air is 760 torr, so water is not “strong” enough to push past the air, and most of the water molecules remain in the liquid phase. But as you raise the temperature of a liquid the vapor pressure increases because the molecules move faster and faster. At 90 ºC the VP of water is about 525 torr. This means that most of the water still remains in the liquid phase, but some of it escapes- you see this in the bubbles that form as water is about to boil- those bubbles are water vapor escaping. Boiling is what happens when the VP of a liquid equals the atmospheric pressure. The VP of water is 100 ºC is 760 torr- the same as the atmospheric pressure. So when water reaches 100 ºC it begins to boil At temperatures above 100 ºC the VP of water is greater than 760 torr so the molecules escape into the air and become water vapor. Q: How does a pressure cooker work? A: A pressure cooker allows you to cook things faster- for example, it might take 10 minutes to cook pasta in a normal pot, but only 8 minutes in a pressure cooker. This is because the pressure inside a pressure cooker is more than the atmospheric pressure, so it takes a higher temperature before water reaches a high enough vapor pressure to boil. The VP of water at 100 ºC is 760 torr and at 110 ºC it’s 1075 torr. So if the pressure inside the pressure cooker is above 1075 torr water can be heated to 110 ºC. Q: Why does it take longer to cook pasta in Colorado? A: This is like the opposite of the pressure cooker scenario. At high altitudes the atmospheric pressure if lower, say, 660 torr instead of 760 torr. 660 torr the bp of water is about 96 ºC. Above that temperature water is no longer water- it’s vapor and can no longer cook your ziti. Because the temperature is lower your food takes slightly longer to cook. I mentioned above that by heating a mixture of two liquids at a temperature in between their boiling you can boil off the lower boiling point liquid. But how can we collect that liquid? We do this using a condenser column. Let’s say you have a mixture of methanol (MeOH, bp 65 ºC) and toluene (Tol., bp 111 ºC). As you heat the mixture the methanol will evaporate, sending methanol vapors through the condenser column. Because you are allowing cold water to run through the condenser, the methanol vapors will cool into liquid methanol, which can be collected at the other end of your setup. To use the methanol/toluene example again, in real life it won’t only be methanol that boils, even if the temperature of the mixture is below the boiling point of toluene! Some toluene will always be collected with the methanol. So to collect a pure sample of methanol you’d have to distill the liquid you collected, and then distill that liquid, and so on. This can be done easily using a fractionating column- instead of a using a distillation column with smooth glass, use one with grooves. The grooves cause droplets to form, evaporate, and then reform again and again as you heat the liquid mixture. This has the same effect of running multiple distillations. If a simple distillation column is called a “plate”, then the efficiency of a fractional distillation can be represented by the number of theoretical plates-it’s equivalent to- the more plates, the better the distillation. But distillation setups can vary in size (or height). Which do you think is more efficient- a distillation setup that fits on your lab bench that has an efficiency of 10 theoretical plates, or another the size of Mendel Hall that’s also 10 theoretical plates? The smaller one is of course. This is expressed in the height equivalent to one theoretical plate (HETP). The lower the HETP the more efficient the distillation. HETP is measured in distance per plate (example: 1cm/plate). An azeotrope is mixture of two substances in a certain ratio that doesn’t change. For example, water and benzene form an azeotrope that is ~9% water by mass and 91% benzene. This azeotrope boils at 70 ºC- and remains an in this ratio in the gas phase. There are whole textbooks on the topic of azeotropes. In an undergraduate orgo lab all you need to know is that azeotropes can really complicate distillations! Normally the lower boiling point liquid boils off first- but with azeotropes that doesn’t happen- they boil off together, making separation impossible beyond a certain percentage purity. One last example- you can’t distill ethanol past ~96% purity because it forms an azeotrope with water (that is 96:4 ethanol-water). This is one reason why you’ll never see a liquor stronger than 192 proof. Attaching a vacuum to your distillation setup has the effect of lowering the boiling points of the liquids in your sample. 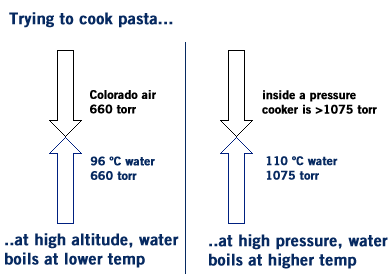 This happens for the same reason that pasta takes longer to cook at high altitudes- the outside pressure is lowered, so liquids boil at a lower vapor pressure. This speeds up the distillation. You probably won’t ever perform a vacuum distillation in an undergraduate orgo lab. But it’s important that you know what effect adding a vacuum has on the process. You are going to distill a ~20 mL mixture of two liquids. For this example let’s say they’re methanol and toluene. The distillation apparatus will take a little while to setup- you may have to check with your TA before you’re allowed to begin. Once it’s setup, begin to heat the mixture using a hot plate. Try to set the temperature so the distillate comes out dropwise. Be patient- sometimes the hot plates take a few minutes to heat up. You’re going to collect the distillate in 2 mL fractions using test tubes- the first 2 mL to distill go in one test tube, the next 2 mL go into another test tube etc. You’ll collect a total of ~10 mL. Every 2 mL you’re also going to record the thermometer reading inside your distillation setup. Finally, you’re going to take GC samples of each of your 2 mL fractions. Expect to see the lower boiling point liquid come out first. For example, the first fraction might be 90:10 methanol-toluene by GC. But the last fraction might be 60:40 methanol-toluene. You’re also going to take a GC of what’s left of your mixture afterward. In this case it should be mostly toluene. 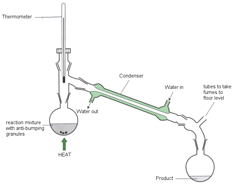 A: The closer in boiling point two liquids are to each other the harder they are to distill. So ethanol/isopropanol is the hardest combination to separate via distillation. Another example- a HETP of 1cm/plate may be OK to separate methanol from ethanol. But you will need a more efficient column to separate ethanol from isopropanol- so the HETP would have to be less than 1cm/plate (ex: 0.1 cm/plate). Q: Which do you think makes for a better separation: distilling quickly at a high temperature or slowly at a low temperature? A: It seems that the best results are always the ones that keep you in lab the longest. If the temperature of the liquid mixture is too high both liquids will boil. This will give you a poor separation.